Every year, millions of Americans mark the Tuesday after Thanksgiving by donating to nonprofit and philanthropic causes as part of Giving Tuesday. This year, The Iowa Center for Public Affairs Journalism-IowaWatch is proud to participate in News Match—the largest-ever grassroots campaign to strengthen nonprofit journalism across the United States— that is launching #GivingNewsDay as part of this nationwide effort. With a goal of making 2017 a record-breaking year for donations to nonprofit news, IowaWatch is joining more than 100 local and investigative newsrooms who are eligible to receive up to $28,000 each in matching grants, totaling more than $6 million in new support for journalism. 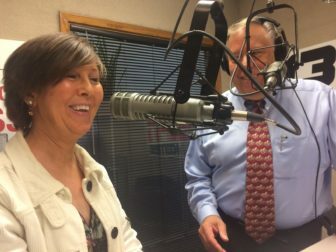 Freelance reporter Cindy Hadish and Insight on Business the News Hour host Michael Libbie before talking on Oct. 9, 2017, on Libbie’s program about Hadish’s story warning of a pending ‘Alzheimer’s tsunami’ in Iowa. Taken in the studios of KPSZ Praise950AM radio in Des Moines. IowaWatch is a non-profit, non-partisan news organization that does investigative and community affairs journalism in collaboration with other newsrooms and trains college students to do this in-depth reporting at a high level. Its stories are at IowaWatch.org, news outlets that publish or air them and in an award-winning weekly radio program, the IowaWatch Connection, that airs on 20 radio stations. IowaWatch’s most recent reports told of Vietnam War veterans’ reflections, what Iowa must do about a pending increase in Alzheimer’s disease in the state and how sheriffs enforce Iowa’s gun permit laws. 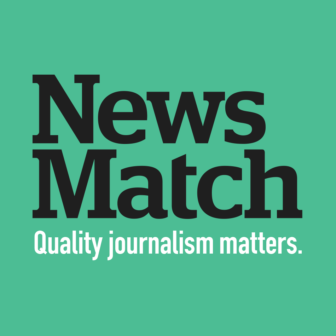 News Match 2017 was launched by Democracy Fund, the John S. and James L. Knight Foundation, and the MacArthur Foundation to support nonprofit news organizations like IowaWatch that play a vital role informing the public and holding those in power accountable. “Trusted nonprofit news organizations like IowaWatch are essential to building stronger communities, holding our decision makers accountable, and providing people with the information they need to contribute to civic change. Ensuring they have a bright future is in all of our interests,” said Jennifer Preston, Knight Foundation vice president for journalism. Anyone can contribute by going to newsmatch.org between now and the end of the year. All news organizations participating in News Match are members in good standing of the Institute for Nonprofit News. To be a member, an organization must be a 501(c)(3) or have a 501(c)3 fiscal sponsor, must be transparent about funding sources, and produce investigative and/or public-service reporting. Donations are tax-deductible as allowed by law. Visit newsmatch.org for more information. The Iowa Center for Public Affairs Journalism-IowaWatch produces investigative and public affairs journalism in collaboration with other Iowa newsrooms and works one-on-one with college students who want to produce this kind of journalism at a professional, ethical level. It is an Institute for Nonprofit News member. For more, go to IowaWatch.org. The Institute for Nonprofit News is an incubator and support network for nonprofit newsrooms, strengthening the sources of independent, public service information and investigative journalism for thousands of communities across the U.S. INN is the only organization in the U.S. specifically focused on supporting the emerging nonprofit news sector. For more, visit INN.org. The Democracy Fund is a bipartisan foundation established by eBay founder and philanthropist Pierre Omidyar to help ensure that our political system can withstand new challenges and deliver on its promise to the American people. Since 2011, Democracy Fund has invested more than $60 million in support of effective governance, modern elections, and a vibrant public square. For more, visit democracyfund.org. I know you are being bombarded today with #GivingTuesday requests for support for your favorite charities. But I’d like to ask you to please consider giving a tax-deductible donation of $25, $50, $100 or more today to our nonprofit, nonpartisan center so that we can continue good work that has been recognized this past year by groups such as the Iowa Broadcast News Association and Society of Professional Journalists.